Vannevar Bush was a well known American engineer, scientist and inventor, who has made many remarkable contributions to modern science. Bush was born in Massachusetts in 1890; he was often sick and bedridden for long periods of time during his childhood. However, he was still confident and intelligent and made good progress in school. He was especially eager to learn mathematics. After school, he enrolled at Tufts College and gained both a bachelors and masters degree in engineering in the span of three years. His first invention, called a profile tracer, came during his years at college. This machine looked like a lawnmower and was used for surveying land and calculating elevations. Despite the fact that it reduced the manual labor required to perform this same task from three men to one, Bush’s invention did not meet with any success as he did not have the necessary marketing or people skills required to sell his product. After graduating from Tufts, Bush worked at General Electric as an equipment tester, but was laid off when a fire broke out in the factory. A professor named Arthur Webster offered him a $1500 grant to conduct his doctoral thesis research on acoustics but Bush declined this offer, and took up a mathematics teaching position at Tufts instead. He then went to MIT and gained his doctorate in engineering in less than a year, only to return to Tufts as an Assistant Professor. During World War I, Bush designed and developed a device for the US Navy that would help to detect submarines using magnetic fields. The director of the National Research Council approved of the idea and Bush was given free reign to run the project. He successfully tested the machine before use, but on board the actual warships, US navy officials claimed that it did not work properly and was practically useless because it could not be deployed. In 1919, Bush joined the electrical engineering department at MIT where he worked towards the development of Analog Machines. These were large mechanical devices with gears that were used to solve mathematical problems such as differential equations. Based on recent advances in technology, Bush offered to build a machine for the FBI that would enable them to review 1000 fingerprints a minute, but this offer was refused by them. He continued to work on it anyway and called his device a Rapid Selector. Although he made very limited progress with it, it was fundamental in laying the foundations for crucial future projects. 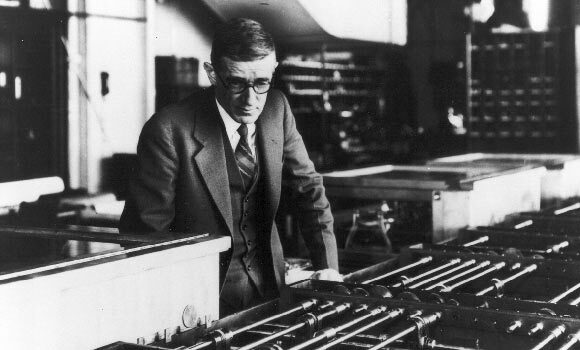 In 1937, Vannevar Bush left MIT to accept the prestigious position of President of the Carnegie Institution. This organization had a large budget for research and even advised the government on an informal basis. Thus, during World War II, Bush met with President Roosevelt and urged him to coordinate efforts for military research by forming a strategic organization for its execution. This suggestion was agreed upon by the President and the NDRC (National Defense Research Committee) was formed. Bush was also closely associated with the Manhattan Project that developed the first atomic bomb and became an important public figure during the war. Bush’s most famous and forward thinking contributions are enumerated in an article that he wrote in 1945 for the Atlantic Monthly. In this article, titled “As We May Think” Bush described a theoretical machine called a “memex”, which would be used for storage and retrieval of information and would be able to make links between documents in the same way that a human brain could. This was just like the concept of Hypertext in modern computing, where documents and information can be linked together in a vast database (which we now call the Internet). Vannevar Bush died on June 30, 1974 at the age of 85. He is remembered as one of the most brilliant and notable scientists of America, and one of the earliest Internet pioneers, even decades before the evolution of the internet and modern computing.